By request, I've been asked to start a trade discussion/approval thread, so we don't have to weed through all of the other posts in the "Scott's IMD Discussion Thread." I see that there is another one of these trade threads that was created this morning. SonofAlois and prov1playa630, I will transfer that agreed upon trade into this thread for approval. For now, let's use this thread as the official trade thread. This is the place where you will let everyone know which players are on the block. If you would like to do a trade with someone in privacy, just PM them, and once you have agreed upon the trade, please post it in this thread. Just make sure that you state that it is an agreed upon trade. No trading between the two teams you control. This is for obvious reasons. No trades can be for "future" draft picks. Because we will not be using these same teams next season, it would be pointless to do a trade that nets you a 2009 first-rounder. For those of you unaware, the NFL teams use a draft-value chart. This chart determines the approximate value of each draft pick. When you are looking for a pick-for-pick trade, you can refer to this value chart. The values for the two sides should be close together, but they may not be exact. Since the compensatory picks are scheduled to be announced tomorrow, we will be using them in the draft. However, trades can NOT involve these picks. If you have any questions or concerns, please post them in this thread. I just talked to Mr. Offseason on AIM, and we both think this trade is pretty fair. It's a unique trade, but I think it is pretty close. To all, I'm going to wait on posting the official 7-round draft order until tomorrow or, more likely, Tuesday. I want to wait until the comp. picks are announced. Once again, those picks cannot be traded. So, until I post the draft order, just make sure that your team has the pick(s) that you're offering someone. Cleveland Browns are looking to deal QB, Brady Quinn. Miami Dolphins are looking to trade down from #1. I realize this pick is going to be hard to trade out of, but I'm willing to sacrifice a little in the way of pick value. I'd like multiple picks, and potentially a player to make the deal more even. Bears......What are you asking for Quinn? Well I think around the value that the Falcons got for Matt Schaub would be fair. Obviously a 2009 pick does me no good, but make me an offer. 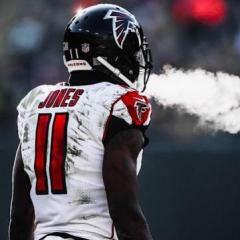 Hey Scott, Atlanta might be interested in Quinn. Want to send me a PM so we can discuss getting him in red & black? When you post the draft order, can you make sure everyone can tell which picks are compensatory by making them another color or something? Just making a suggestion. Sure. I still need to find the complete draft order. Do you know where to find one? Here is the list. I'm guessing they'll update it with the compensatory picks when they are announced. Hey Mr. Offseason, there is a player on the Ravens I am interested in. Send me a PM when you get a chance. I approve the Fitzgerald trade too, how many approvals do you need? PM me with offers for the #12 pick, with the Broncos. Darren McFadden is up for grabs, looking to trade down from the #3 spot. St. Louis has Leonard Little and Randy McMichael on the block. Also looking to trade down from the #2 spot. What do our rosters look like? Do we have all of the free agents that were signed in reality? What about players that our teams cut? The rosters are the way they look as of today. The teams are as they are NOW. So DeAngelo Hall is with the Raiders, Alan Faneca w/ the Jets, etc. etc. Donavan McNabb, QB When healthy he is a dominant NFL QB that has two weapons, his arms and feet. John Runyan, RT Plays with a mean streak, and has always been reliable. Sean Considine, SS young SS that has very good coverage skills. L.J. Smith, TE Young TE that can get the job done in the middle. He could help out on any team. why dont we have like a 1st, 2nd , 3rd place honors for this draft. The commisioners commitee or whatever can decide who had the best draft and offseason based on needs, players, and how the team will look after the moves?